Dion Waiters (knee) along with Anderson Varejao (back) and C.J. Miles (ankle) remain out for the Cavaliers in Saturday's matchup with Memphis. CLEVELAND: C Spencer Hawes; PF Tristan Thompson; SF Luol Deng; SG Jarrett Jack; PG Kyrie Irving. MEMPHIS: C Marc Gasol; PF Zach Randolph; SF Tayshaun Prince; SG Courtney Lee; PG Mike Conley. — This is a game the Cavaliers should lose. And it’s not the end of the world if they do. The Cavs are on the road against a pretty good team that lost last night (at the Thunder), and is fighting for a playoff spot in the Western Conference. 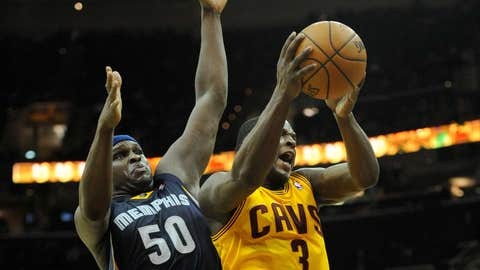 Plus, the Grizzlies play a grind-it-out style like the Cavs try to do – only better. The Griz are more experienced and know how to win. According to Kyrie, the fan said, "I love you." Kyrie responded, "I love you, too, man." — On top of all that, yes, Anderson Varejao (back), Dion Waiters (knee) and C.J. Miles (ankle) remain out. None made the trip to Memphis. Varejao was huge when the Cavs beat the Grizzlies in Cleveland before the All-Star break, helping to keep talented big men Marc Gasol and Zach Randolph in check. 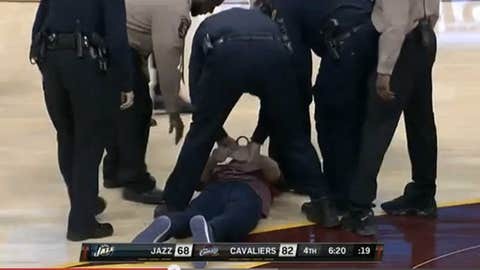 It was Varejao’s last game before his most recent injury. — According to the Cavs, Varejao and Waiters are on track to return soon. Varejao said the same to the Akron Beacon Journal on Friday. Both could return next week – although that’s still just speculation. — Even with the injuries, the Cavs are the more-athletic team. If they can push the tempo as they did in wins over the Thunder and Jazz, they might be able to pull the upset. But I don’t foresee the Grizzlies allowing that to happen. — OK, I’ve been harping on the offense for a good month. Overall, I don’t like it. I think it’s too ugly and guys struggle to get decent shots (at least consistently). No one enjoys playing in an offense that makes them do all the work. But guess what? The Cavs have won eight of 11. People do enjoy winning. And although there seems to be no real plan, if Kyrie Irving is creating, Spencer Hawes is hitting, and guys are moving, good things happen. So while I often blame coach Mike Brown, the offense can be as good as the players make it. — Anyway, I bring all that up because I’m going to do something Brown loves. I’m gonna talk about defense. And yes, the Cavs are better than last season. That may not be hard to do since they were worst in the league under Byron Scott. But aside from Luol Deng and maybe Varejao, nobody on this roster can be accused of being a fantastic individual defender. Or really anything close. — The Cavs’ are 15th in the NBA in points allowed (101 per game). When I look at the lack of defenders on the roster, then read that stat, I find it somewhat miraculous. Sometimes when I watch the Cavs, I just think about how horrendous they are defensively. But the numbers say otherwise, and you gotta give Brown credit for getting these guys to bend their knees and shuffle their feet. — As Jason Lloyd of the Beacon Journal pointed out in his excellent Final Thoughts column, the Bulls are strangling opponents into the second-lowest field-goal percentage and second-fewest points in the entire NBA. They also are the league’s lowest-scoring team at 93.1 points. — Yet the Bulls are an Eastern Conference-best 20-8 in 2014 and have done it despite trading Deng to the Cavs for nothing and losing Derrick Rose (again) to knee injury. Yes, Bulls coach Tom Thibodeau has his team’s attention and trust – but it didn’t happen in the blink of an eye. He needed time to develop those things, and that’s basically where Brown is today. — Not that Brown has a ton of time. Cavs owner Dan Gilbert’s company isn’t called "Take Your Time Loans," or "It’s A Process Loans." So it will likely be good for everyone involved if the Cavs do what they need to do quickly. — The Cavs are 3.5 games behind the Hawks for the final playoff spot. So like I said, if the Cavs lose tonight, they still have time. I don’t expect them to win, but I believe I wrote "no chance" before the game at Oklahoma City. Tonight’s prediction: If the Cavs can hit 100, they’ll win. But Memphis will beat them in one those brutally ugly jobs at home.